Heidi is our kind and gentle herd queen. She oozes breed and dairy character, and has a beautifully shapped and well attached udder. She easily achieved her MILK STAR in 2007 and was also recognized for type & production with the SUPERIOR GENETICS designation. Her permanent linear appraisal was in 2008 with 90 (VEEE). 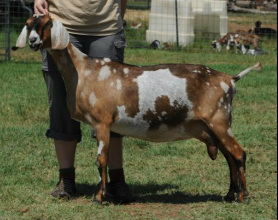 This girl is holding up well getting a score of 90 (VEEV) in 2011 at 8-1/2 years old !!! We like Heidi so much we've kept several of her wonderful offspring in our herd. 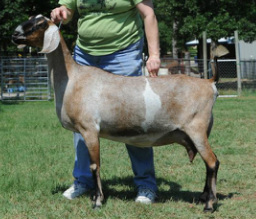 Two of her offspring, Lightning and Michelle received their Superior Genetics (SG) designation in 2013 !